THE GAGSTERS OF "CAN YOU TOP THIS" - FORD, LAURIE & HERSHFIELD. A master at switching jokes to fit different situations, the 43 year old humorist did a switch on the format of Stop Me If You’ve Heard This One and came up with Can You Top This? Instead of his panel attempting to beat Berle to punch lines of jokes submitted by listeners, Ford’s concept was simply a competition - three panelists matching jokes from memory on specified subjects against jokes submitted by listeners and read by a professional storyteller. Ford sold the show to Colgate Palmolive Peet for a trial run on New York City’s WOR in late 1940 The “trial” lasted five years. An episode from the WOR run, April 21, 1942, is also posted below. Over 3,000 jokes a week were reported to have been submitted by listeners to Can You Top This? at the show’s peak but only five or six were chosen to be read by Peter Donald on each show. A number of formulas were used over the years to award the show’s minor cash prizes which never exceeded $25 and all depended on audience reaction as registered on the program’s Laugh Meter, an oversized decibel meter mounted on the stage. Along with the money winning listeners were also awarded a phonograph record of Peter Donald reading their joke and a Can You Top This? joke book. For its first four NBC seasons Can You Top This? was matched up against the final fifteen minutes of Your Hit Parade on CBS when the top three songs of the week were announced and performed. From 1942 through 1945 the jokesters remained in the shadows of Hit Parade with a Top 50 show and ratings in the teens that consistently finished among Saturday’s Top Five but could never quite edge out its pop music competition. Then in 1945-46, operatic singer Lawrence Tibbett replaced Frank Sinatra as the lead of Your Hit Parade and Can You Top This? won its 9:30 timeslot. NBC scored a major commercial victory in 1946 when it stole American Tobacco’s Your Hit Parade from CBS and converted it to 30 minutes. The show that was the major competitor to Can You Top This? was suddenly its lead-in. But both shows suffered in the ratings and Colgate replaced Can You Top This? with the more musically oriented Judy Canova Show and Kay Kyser Kollege of Musical Knowledge. Meanwhile, the soap company moved Can You Top This? back to Friday nights on NBC where it scored its highest rating yet, a 13.9, against This Is Your FBI on ABC and The Adventures of The Thin Man on CBS. Two shows from the 1947-48 season, November 7th and November 28th, are posted below. 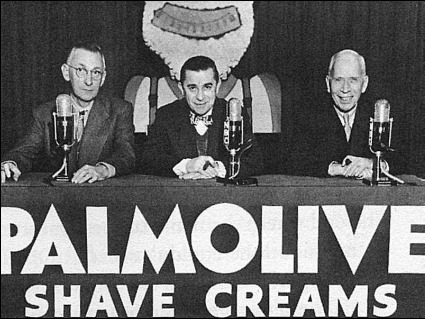 The senior citizens with their collections of aging jokes were cancelled by Colgate and NBC after an encore Saturday night run of two months in the summer of 1948. Then the merry band returned to WOR and Mutual for a two season run on Wednesday nights until 1950 when they worked a split season on ABC, half on Saturday nights at 9:30 and half on Tuesday 8:00. Ed Ford and Roger Bower had amassed a collection of recordings from past broadcasts of Can You Top This? and put them into syndication when the show left Network Radio. The editing on the sample also posted below is crude - to put it kindly - yet the jokes remain. And that’s what Can You Top This? was all about - punch lines and laughs. Senator Ford’s faith in old jokes gave him the last laugh - all the way to the bank. (1) Brooklyn born Edward Hastings Ford was a grumpy, deep-voiced vaudeville comedian who adopted the stage name, “Senator Ed Ford From Michigan”, in his twenties. Stop Me If You’ve Heard This One’s roster of panelists over its brief run included Ford, Jay C. Flippen, Lionel Stander, Harry McNaughton, Harry Hershfield and Ward Wilson. (2) Ford, Laurie and Hershfield claimed a mental inventory of over 15,000 jokes. At 32, Peter Donald was the youngster of the group and was familiar to listeners as Ajax Cassidy of Fred Allen’s Allen’s Alley. (3) Like Ed Ford and Harry Hershfield, Ward Wilson was another veteran of Stop Me If You‘ve Heard This One. Roger Bower was primarily a Mutual producer/director who hosted the return of Stop Me If You’ve Heard This One for a season’s run on Mutual in 1947-48 with comedians Morey Amsterdam, Lew Lehr and Cal Tinney.